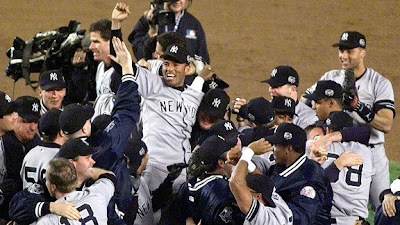 "Mariano Rivera's most memorable Subway Series moment wasn't when he notched career save 500 or career RBI No. 1, which happened the same Sunday night in 2009. Nor was it the 2000 World Series, when he saved Games 4 and 5. "For me, they're not our rivals. It's more the fans," said Rivera, who will be honored by the Mets before Tuesday night's game at Citi Field. "The fans make it huge."" Rivera has pitched 2 saves in one day 6 times: 5/26/10, 5/3/07, 9/29/04, 7/8/2000, and I don't have the other 2, but a 5/3/07 AP article said he had 5 as of 5/3/07 citing Elias. The link from Sporting News is now inactive. "Rivera saved two games in one day for the fifth time in his major league career, according to the Elias Sports Bureau, the first since Sept. 29, 2004, against Minnesota. Rivera, who has three saves in five chances this season, pitched a 1-2-3 inning in the opener but allowed a pair of singles leading off the ninth in the second game before striking out Gerald Laird and getting Kenny Lofton to ground into a double play." "Although it won't go into the record books as a two-save day - the first game was a continuation of Tuesday's suspended game, so it will go down as having taken place on May 25 - it was the first time since May 3, 2007 that Rivera earned two saves on the same day." Rivera's first major league rbi was at the 2009 Subway Series on 6/28/09. As it happens, it was a bases loaded walk off Krod in the top of the 9th. His 4 out save that date was regular season save #500. "He basically dominates you with one pitch. Everybody says the same thing. He'll tell you what's coming and you're still not going to hit him. His ability to locate that pitch and the presence. He's the best to ever do it and I've seen first-hand how dominating he can be."